This Giveaway is now Closed. Winner to be announced shortly. As you probably know, I’m a big fan of decorating your walls with photos and wall art. I recently wrote an article for the Photobox blog on just that, indulging my passion, and inspiring myself at the same time. I’ve reviewed some Photobox products on the blog before, including the collage canvas and some great gift accessories at Christmas, and today I’m looking at two more products from the Photobox range, the Box Framed Prints and Framed Poster prints. I’ve also got a fantastic Photobox giveaway at the bottom of the post, so keep reading. 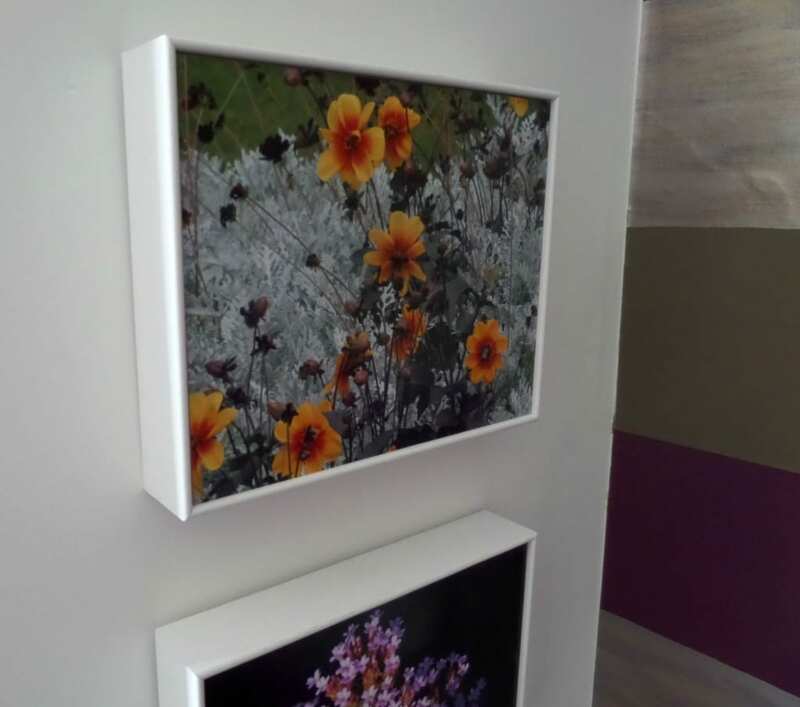 Whilst browsing the Photobox website, the Box Framed prints caught my eye for some garden shots I took last year, after we had renovated the back garden area. I was messing about with settings on a relatively new camera, and was really pleased with the shots I’d taken. Don’t you find you end up just leaving the uploaded photos on your pc, and never do anything special with them? I might share them on Instagram, but often that’s as far as it goes. 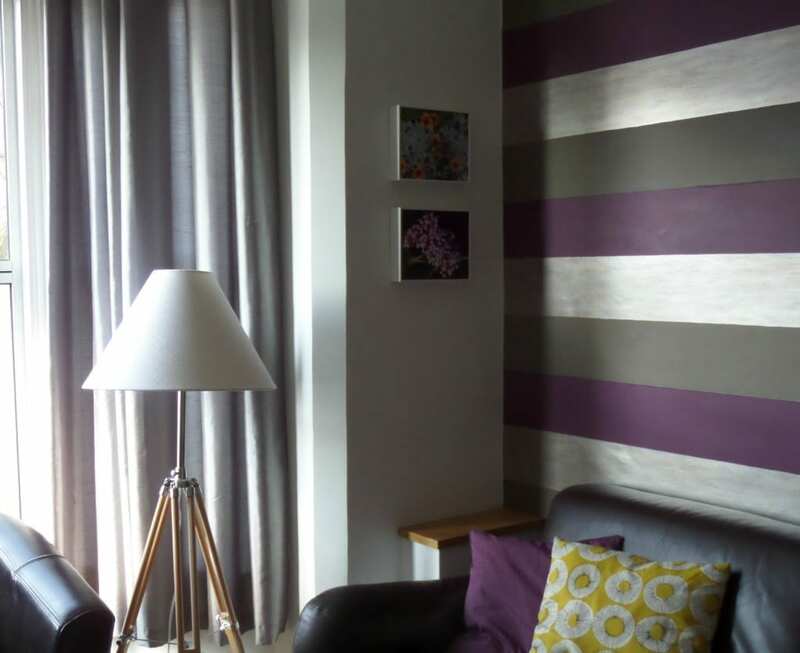 With a bare area of wall in the living room crying out to be filled, this was a great opportunity to find some colourful pictures that would add some lively interest. 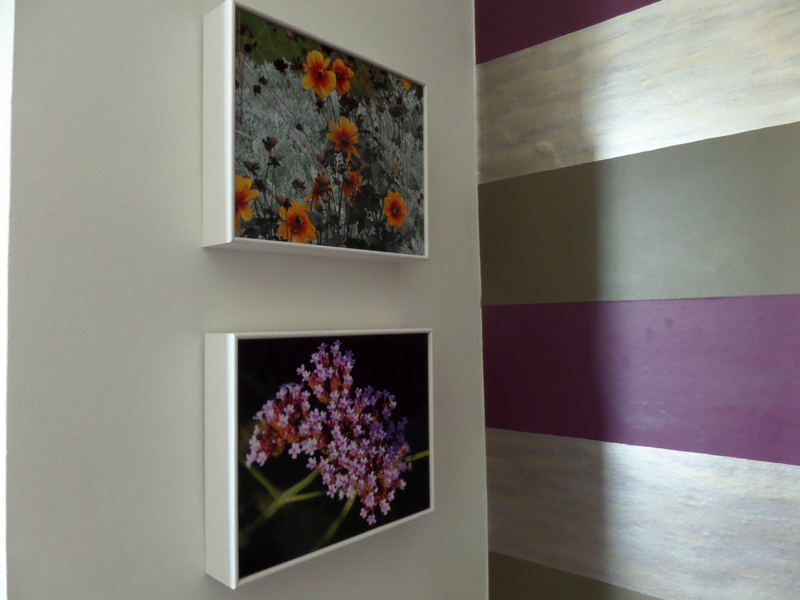 As you can see from the images, I’ve chosen photographs that complement the room scheme, in terms of their colouring. I have other white framed prints on the walls, so choosing these with a white frame continued that theme, and the purple and contrasting orange work well with my decor. I’m really pleased with them, and might have to invest in a few more for the same wall! I love these prints. They’re different to a canvas, and have a soft satin finish to the image, and there’s no glass covering it either. As you can see, they are very deep, and give a gorgeous 3D effect off the wall. I would highly recommend! Box framed prints start at £34.99 for a 25cm x 20cm rectangular frame (which is what you see here) and come in 3 frame finishes, white, brown and black. Secondly, I decided to try out a Framed Poster Print because I had a lovely image I wanted to have printed up, and because I hate hunting around for the right sized frame. I thought this would solve that issue immediately. 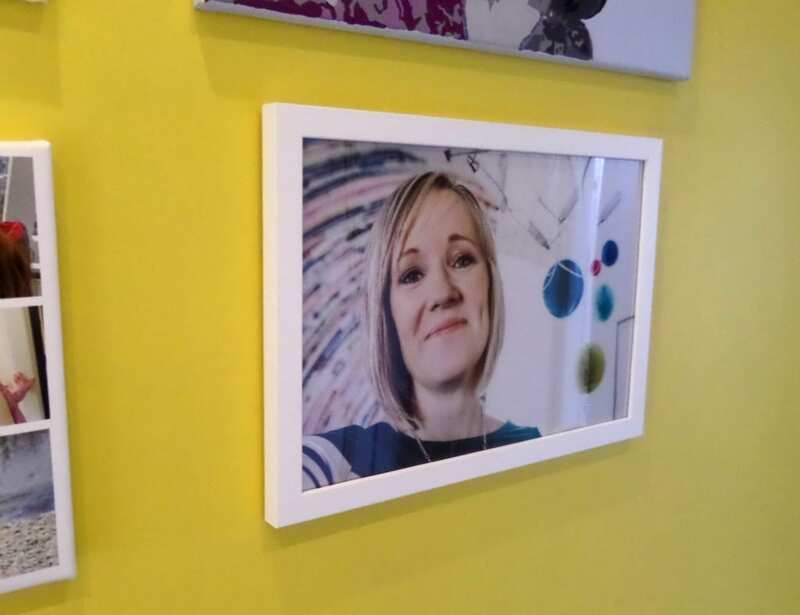 You may have noticed the fabulous new photograph of me, taken by the eBay team for the launch of the eBay collections, which I’ve been so pleased to be a part of. It seemed fitting to commemorate such an exciting experience by printing and framing the image, and I’m really pleased with the result. 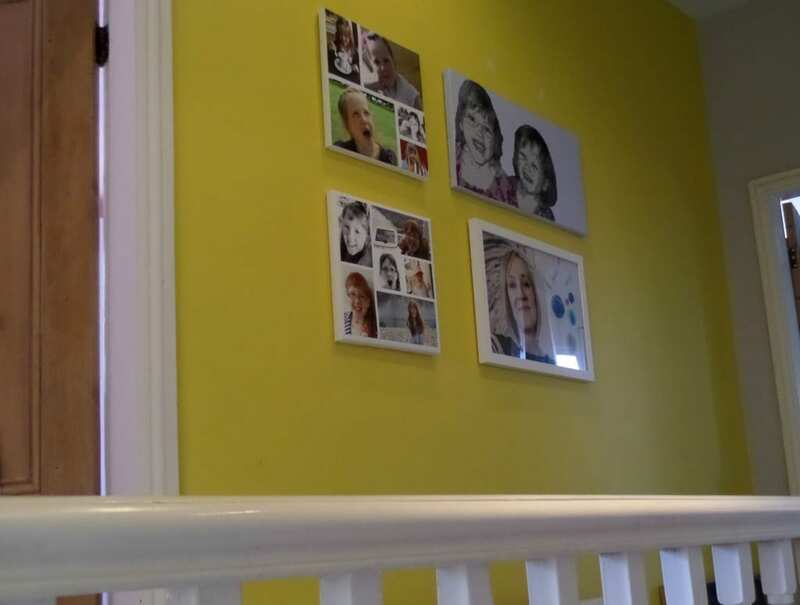 It’s been added to a wall on our landing, where I’m slowly building a family portrait wall collage. This is an 18 x 12 inch Framed Poster Print, in landscape obviously and is currently available for £44.99. The quality, as with all Photobox products is just superb. The choice of finishes and frames is good, and I’m always impressed with the packaging and delivery process. (I’m not receiving anything special because of the review, I order from the website in the same way as any customer). Then leave a comment here, letting me know you’ve done it. The prize is a voucher £100 to spend at Photobox. There is no cash alternative. Entrants can also follow Love Chic Living on Twitter, follow Photobox on Twitter, follow Love Chic Living on Facebook and Follow Photobox on Facebook for extra entries. Individual comments must be left for all additional entries. The prize will be sent from the Photobox team. I follow Photobox on Facebook. Followed PhotoBox on Twitter as @UkPseudo. Followed @lovechicliving on Twitter as @UkPseudo. Liked Love Chic Living on Facebook as Caroline Spring Clarke. Liked PhotoBox on Facebook as Caroline Spring Clarke. Tweeted & followed all on FB too. Tweeted – already following Photobox on FB and Twitter, now following you too ! I’ve liked Photobox on Facebook. I’ve liked Love Chic Living on Facebook. Liked both Photobox and Love Chic Living on Facebook. Tweeted 🙂 Done and Done. I have tweeted as @clairewoods32. Thank you. I have tweeted the message and have or are already following. I follow Photobox on Twitter. Following @Photobox on Twitter too 😉 Thank-you! Following you on twitter and agree about the moroccan bowls! I follow PhotoBox on FB – though their challenge photos make me feel very sorry for myself! Tweeted @bambinogibson I have been a fan of photo box for years. ! Like Love Chic Living on Facebook. Tweeted as TRACYMOORE66 Liked on both facebooks & following both. I like Photobox on Facebook. I have tweeted @LisaComping1972 and followed both on FB and twitter.